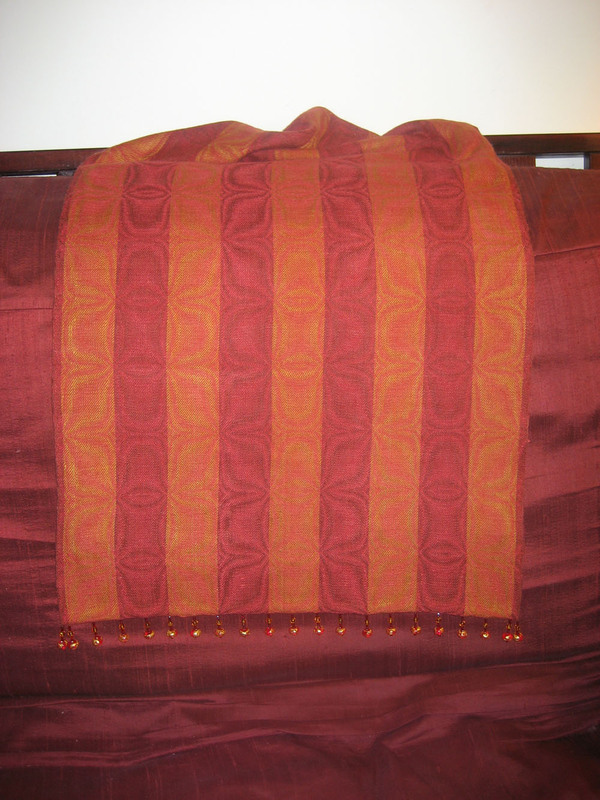 The first shows most of the shawl, the second shows the beaded fringe. I’m very pleased with it – the gold foil sets off the tan/gold warp and the overall effect is of antique gold and rubies.Â The big garnet beads match perfectly, and the amber accent beads are nice as well.Â I really should have photographed it against something light-colored so the beads would show up more distinctly, but Mike is in the bed right now and I don’t have any other horizontal surface that isn’t covered in stuff!Â So this will have to do for now. This and the brown/tan jacket are both going off to the Black Sheep Guild’s exhibit booth on computer-assisted weaving.Â I hope it will inspire some people to see computer-assisted weaving as an art form and not as “cheating” (which some people apparently do.Â beats me why.). Meanwhile, I have inspected the painted warp. It looks glorious except for one thing – where I tied the choke ties, the warp is still white.Â I knew that was going to happen when I painted it – unfortunately I had already soaked the yarns when I realized the error of tying tight choke ties – but it is still distressing.Â It will definitely not be the “perfect project” I’ve been seeking, but, well – let’s see how it looks on the loom.Â I think it will be OK for casual wear, but I could just weep at the white spots in an otherwise beautifully colored warp.Â Next time I will tie loose ties instead of tight choke ties. Oh well.Â It will still look fine from five feet away, I guess.Â It’s just that I’m seeking perfection. another gorgeous piece! wonderful colors. As to those white spots, they make me want to cry when they show up in *my* dyeing too! Once you get it warped, you might be able to cover most of them with permanent magic marker, or a textile paint that doesn’t need to be heat set. I’ve used magic markers to great effect on some of my knitting. Seeking perfection? Oy! there lies the road to insanity! Your work is so beautiful! And your enthusiasm for weaving is contagious! I know that your pieces will inspire others to investigate computer assisted weaving- it has me! I am saving my pennies towards a comp- assisted loom. Tien, I have a thougth aobut your hand painted warp- did you know that you can paint the warp while it is on the loom? I have seen this done in classes at Fashion Intstitute of Technology. Please consider giving it a try, at least on one section of choke ties. 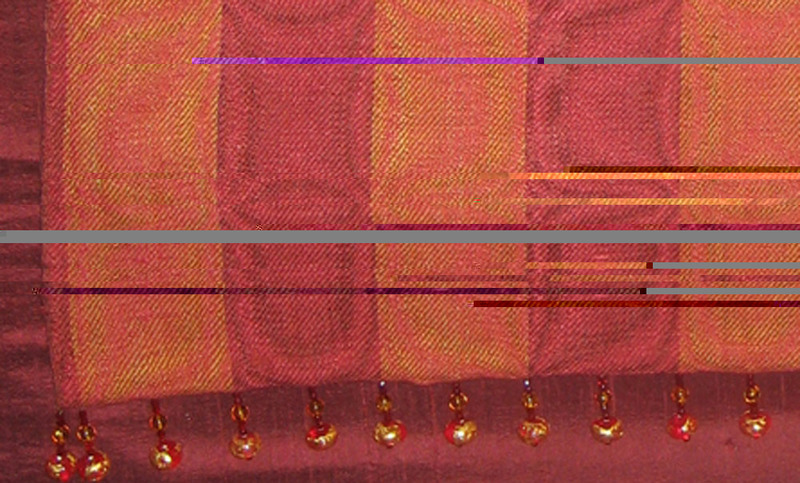 I think that the nature of the hand painted warp- the “organic-ness” of it, enables you to go back into it and redye. Perhaps I’m missing something, but it seems to me that it woudl be a relatively “quick fix”. I love you excitement over weaving and I always enjoye reading your comments. Happy Weaving!